Allie is three years old. She is highly verbal. She amazes her parents, Paul and Michelle, with her language, her insightful questions and her observations on a daily basis. Paul and Michelle are pretty sure she’s smart, and creative, too. They are looking for a four-year-old preschool program for Allie for next year. They have read how important it is to find the “right match” for Allie. Several of the preschools in the area advertise that their pre-K is “Reggio inspired,” and Paul and Michelle have heard that that is a good thing. They’ve done some research, and they really like what they’ve read. Small groups of children working on different endeavors. Perhaps one group resuming work on yesterday’s goal of building a block castle taller than they’ve built before. Another group working with a teacher on an ongoing project to make a birdhouse out of clay. Another small group studying through drawing a butterfly that volunteered in the outdoor classroom and is temporarily captured in a large cylindrical net habitat. Three children working together to create the longest train ever with magnet rods. And a small group working to write letters to a friend who has been home sick for a few days. They are helping each other write the words, but every now and again, they get stuck. Then one of them goes to the teacher with pen and paper, and she helps him hear the sounds of the word in question so he can write it. It’s peaceful, but not silent, in the classroom, with occasional interruptions by an expression of joy or excitement. Another adult, who could be an assistant teacher or a volunteer, walks around to lend whatever help or control the children might need. At times she picks up a camera and documents the children’s process. The children appear to pay her no mind unless they need her, but she knows they are borrowing from her presence the ability to self-regulate. Allie’s parents are convinced that the Reggio-inspired classrooms they have seen online would be perfect for her. But they wonder…is what they are seeing when they visit the local schools Reggio inspired in a meaningful way? 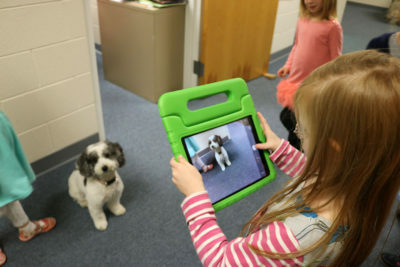 Taking a picture of our therapy dog, Lucy, for the eBook about class pets. It was early in the school year in pre-K, September in fact. 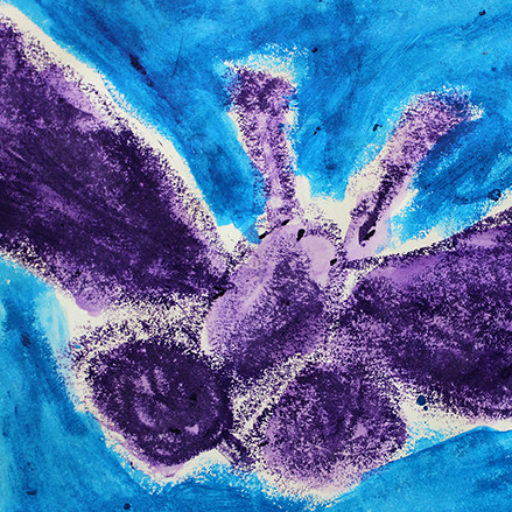 On the way to her classroom, five-year-old H spied some birds in a Kindergarten classroom. She wanted to stop and take a picture of the birds, but the teacher who was with her did not have a camera. So H came up with a plan to get that picture. What does working with Reggio principles require of the teacher? Reggio principles invite American teachers into unfamiliar territory. Where they may be accustomed to describing children as “cute” and teaching as imparting information for its own sake, the image of the child in the Reggio philosophy is of a competent, complete, resourceful citizen with ideas, questions and proposals worthy of the teacher’s time. The Reggio-inspired teacher sees teaching as an exchange between the children and herself. The teacher sets up the environment with invitations for the child. The child engages with those invitations, and the teacher tries to read the child’s intent (regarding the child’s interest in one aspect of the topic, or his desire to represent an association with the topic, or his interest in forming a collaborative group to initiate a project…just a few of the many possibilities). The teacher learns when and how to offer support for the children’s intent; they respond; she responds, and so on…an ongoing exchange. Learning to do all of this takes time. I know of schools that believe that being Reggio-inspired is an instant truth if they declare it. Not so. It takes time. The danger is in believing you have “arrived.” On this journey, we never arrive. Those who are serious about Reggio-inspiration take joy in this fact. The classroom is a place for learning by children and teachers, always. Reggio inspiration is dynamic and alive. This is another disposition that can be a challenge for American educators who are accustomed to lesson plans and knowing when study of a particular topic will begin and when it will end. In a Reggio inspired classroom, the teacher’s goal tends to be to sustain the children’s interest in a topic as long as possible so they can go deeper in their understanding. This also requires a different perspective on time. In a way, time becomes the teacher’s friend, as opposed to the stressor it tends to be in more “traditional” ways of teaching. We all know that the learning environment needs to be regulated so that learning can actually take place. The difference in a Reggio-inspired classroom is that the children are encouraged to self regulate, and to share decision-making with fellow students and teachers. With very young children this may begin with students learning to make plans for what they will do during a particular time period, perhaps, in time, declaring that plan publicly with increasing detail. Children with more experience might declare a plan, call for collaborators, work on the project over several days (sometimes weeks or months), engage in iteration (i.e. try new approaches when one attempt fails) and present/offer the project to the rest of the class when it is finished. The teacher in the latter scenario is still involved as she is needed, documenting, reminding members of the group of their process the day before, challenging thinking at times, offering materials, tools and techniques as needed, and so forth. She is no less active than she would be in a traditional learning context. But she is supporting the children’s intent, not her own. And lest you think this is not possible with young children, this was the norm by mid-year with the five year olds in my class, and some of the four year olds as well. In the traditional educational model, teaching flows one way, from teacher to student. 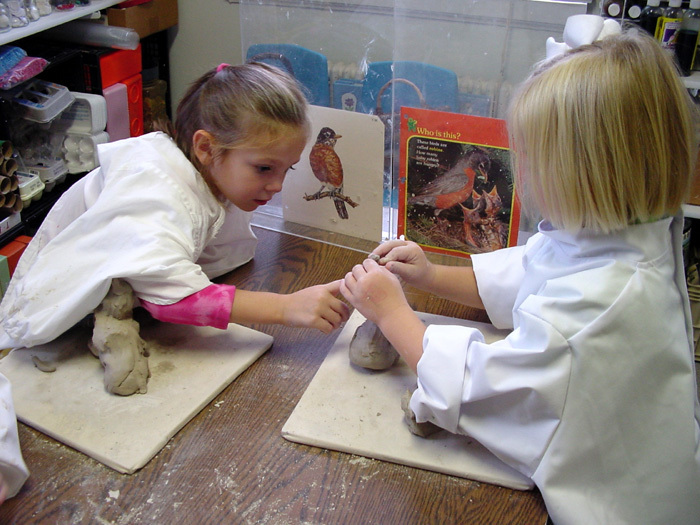 The Reggio-inspired teacher, however, expects to be a learner as well as a teacher. She learns from the child about that child, about children and development in general, and about learning and how it happens. Wonder and questions are permanent residents of her mind as she lives the life of the classroom. She documents her observations of children’s process and collaborates with colleagues to interpret those observations. And she makes her findings public on some level, whether for colleagues, parents, administrators or the education world at large. Allie’s parents created for themselves a checklist of the characteristics of a Reggio-inspired classroom, to use as a reference when they visit the “Reggio-inspired” schools in their area. They visited with greater confidence in their criteria for a school for Allie. Here is their (annotated) checklist. An image of the child as intelligent, resourceful, full of ideas, and out for relationship with people and ideas. Do we see this image in the teachers’ relationship and interactions with the children? Do they listen and respond to what the children are really saying? Are children encouraged to do hard things themselves, with support from the teachers or other more experienced children, or does the teacher do much of the task for the children? The environment is the third teacher. Is the environment rich, readable by a child, and beautiful? Do we see invitations in the environment for children to engage with ideas in rich ways? Does it look as if the environment is set up intentionally? Can children access materials themselves, and do they seem to feel free to do so? When you pause for a moment in the doorway, pay attention to your physical reaction. Are you drawn in? Or does color or clutter push you away a little? We adults tend to ignore that little push and go in anyway. But “environmental repellents” like overwhelming use of color, ready-made posters or disorganized materials affect children all day long. Project-Orientation. In addition to play (which is its own laboratory), are children engaged in small group projects to investigate or represent something important to them? Or are they doing teacher-assigned seatwork? Are the children engaged in what they are doing, or does the teacher have to keep sending them back to the work? Can we see that children are learning many things through what they are doing, or is it clear that the children are supposed to engage with one teacher-generated concept (as with many worksheets or even at centers with narrow scope)? Collaboration. Are children working and playing in small collaborative groups? Or are they being encouraged to “do their own work?” Do teachers collaborate with children to make their own ideas visible, or are they more directive (“This is how you draw a horse.”)? Documentation. Are teachers photographing children’s process, taking notes, recording conversations, or otherwise documenting? Is there evidence of documentation in the form of blogs, notebooks, documentation panels, etc. in the classroom? If we walked into this classroom and there were no children here, would we be able to deduce something about them just from documentation in the environment? Relationship. Do children seem to know each other well? Does the teacher know them well? Is the relationship between children and teachers warm and trusting? Is there evidence of a collaborative relationship between home and school? Or does the school view learning as the school’s territory (“Leave the learning to us”)? Emphasis on construction of theory about how the world works. If a child notices something…say, a rainbow on the wall cast by a prism in the window…what is the teacher’s response? Does she wonder with the child about the rainbow? Does she elicit the child’s theory about where the rainbow came from? Does she invite children to think about it together? Or does she tell the child, “Oh, that comes from this prism.” Does the conversation continue? Or does what the teacher says end it? Symbolic Representation. Are children encouraged to represent their ideas and observations through graphic media? Are they drawing, painting, sculpting, constructing, creating? Does the teacher challenge them to make more complete representations, for themselves and to communicate with others? Do we see many different media accessible to the children? Or do we see only markers or crayons? Do the teachers support and challenge children as they are representing or are children left alone to make the same picture over and over again? A Reggio-inspired classroom is a special place. It will never be the same place two days in a row or two years in a row, because everyone there, children and teachers, is learning constantly. Working with Reggio inspiration is a journey. But there are practices that further that journey and practices that make it an impossibility. Calling ourselves “Reggio inspired” requires a commitment and a responsibility, in my opinion. We owe it to young children.